Winmate rolls out a new ultra slim, ultra light, low power, dual display, cost effective and high performance fanless VESA PC, which is the coolest choice for Display Combined Applications. V270SB7-301 VESA PC is equipped with the VIA C7-M Ultra Low Voltage processor 1.2/1.6GHz and VIA VX700 integrated single system chipset. It is designed to enable dual display by VESA100 mounting to the monitors. Ultra Slim for Saving Space: V270 VESA PC is only 300x180x25.4 mm in Dimension. Dual Display Output: Two DVI-D, VGA, S-Video interfaces could be chosen to show two independent, clone and extended desktop. Ultra Light in Weight: V270 could be mounted to the back of the display without causing over load the display with only 1.67Kg. Low Power Consumption: Only 7.5 Watt in CPU and 36 Watt in whole system including CPU. Aluminum Profile With Fin: Themel optimized fanless solution. 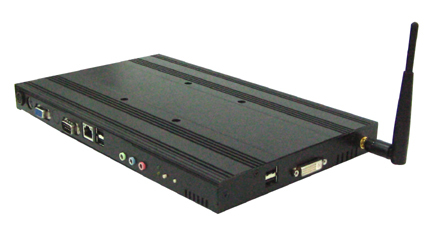 Support +12V DC-IN power input without DC/DC converter, which will reduce the power wastage.